We sat down with the founder of Indygo Junction, Amy Barickman to hear the Fabriflair story. Looking for a fun new product to sell in your shop? 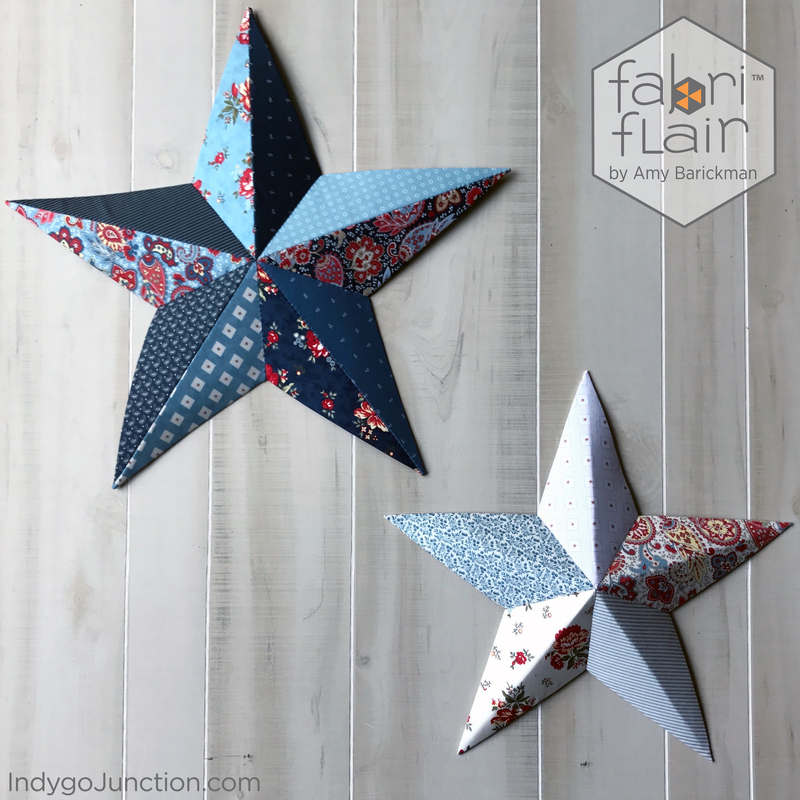 Fabriflair is the latest product release from Indygo Junction, perfectly poised to help you display and sell fabric, sell tools, teach classes for all ages and stages of sewists and, most importantly, start conversations with your customers. Indygo Junction first introduced the Fabriflair matboard template kits a little over a year ago. This method was based on paper piecing and used their hand stitched technique. The kits have been very popular and they saw the need for a machine sewn version. Now, with their new Fabriflair stabilizer and pattern line you can choose to sew hand or machine. The stabilizer is packaged in a 10” x 10” format and we also offer it in 20” wide, 10 yard bolts. The material is designed to be thick enough for our Fabriflair designs to hold their shape but it is also flexible which allows for machine sewing. Also included is a pressing sheet in each package plus an ornament pattern to get customers started. Watch the video below to explore Indygo Junction’s full line of patterns, see the samples they have made, and learn tips and techniques as well as marketing ideas for your store. This product line offers a fun and easy opportunity to grow sales in your store as well as your community. The entire line is ideal for precuts and fat quarters. All of the patterns can be made with 10” squares. This makes it a quick and easy way to showcase new fabric lines allowing for customization for your shop’s space and style. The Centerpiece Star, for example, has 60 sides and can display an entire line. 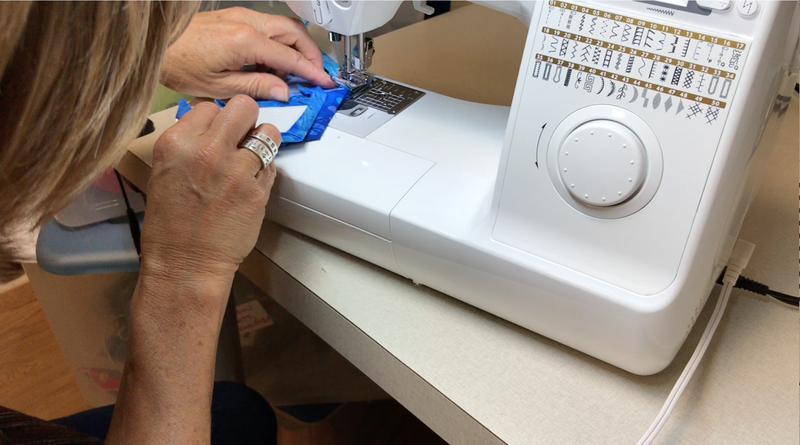 Fabriflair is for all ages and stages of quilters and sewers, from kids to professional quilters this product offers makers impressive results for a small investment of time. In an hour you can make the single arm Wall Art Star in one of your new lines. 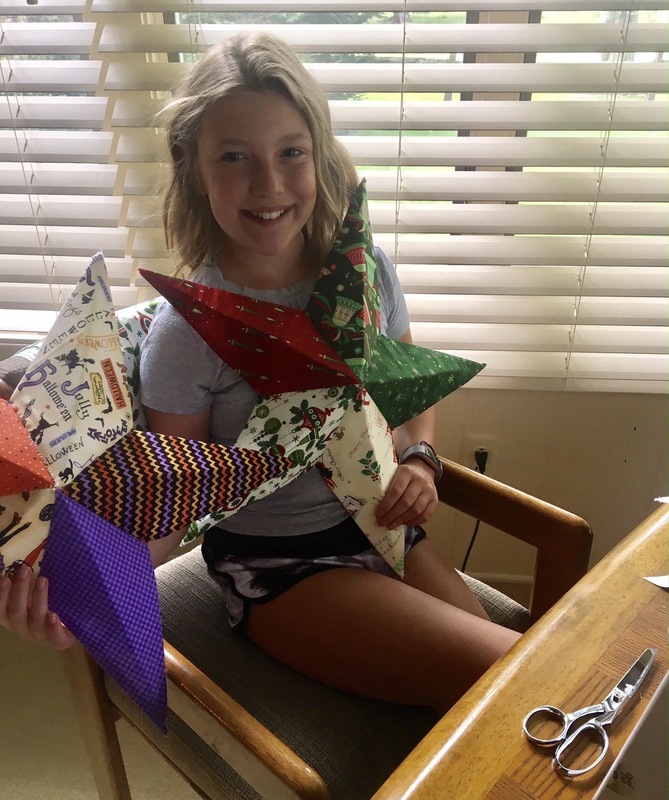 Isn’t this picture of Amy’s niece holding the stars that she made with her mom precious? Not only can you create with unique fabrics, but you can also use beads, buttons, and all sorts of notions to add a personal pizazz to your finished look. Check out these Tree Toppers & Ornaments Indygo Junction made and decorated with beading pins! Fabriflair is a fabric amusement! It is a conversation starter at the register and is ideal for classes or demonstrating at events. It can also be a project to travel with that can be sewn by hand at retreat gatherings or sewing circles. Indygo Junction loves sharing information to help you educate and inspire your customers to try Fabriflair. Through their newsletter and blog, they share assets for you to use, such as sample photos and gifs for Facebook and Instagram. Here are some display ideas from the Fabriflair Sew Stars Event I did last week at Prairie Point Quilt Shop in Lenexa, Kansas. Here are some display ideas from the Fabriflair Sew Stars Event Amy did last week at Prairie Point Quilt Shop in Lenexa, Kansas. Check out their new campaign below, where Amy discusses the Sew Stars for Texas campaign for hurricane relief. Note that the campaign has expanded beyond Texas to include victims of Irma and Maria as well as Hurricane Harvey. Indygo Junction also now offers free shipping on all pattern orders over $100 for shops! Visit IndygoJunction.com to see all their Fabriflair products as well as new releases of apparel patterns featuring quilt shop cottons.